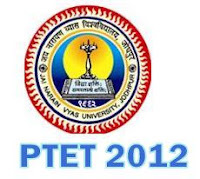 Rajasthan Pre Teachers Entrance Test (PTET) 2012 Online Counselling will begins from 11th June 2012(Monday) after PTET 2012 Result is announced on 23rd May 2012 by Jai Narain Vyas University(JNVU) Jodhpur for admission to B.Ed. Course, Session 2012-13 in various Teacher Training Institutions in the State of Rajasthan. PTET 2012 Official website http://ptetadmissions.nic.in/ issued Notification for RTET 2012 Counselling Date, Counselling Schedule, Colleges List and other details. For Latest News on PTET 2012 Counseling Follow us on GOOGLE+ or FACEBOOK. For details Students can visit PTET 2012 Counselling Notification issued on 8th June 2012 or PTET 2012 Public Relation Officer(PRO), Ramnivas Choudhary on 0291-2652653, 2635598 (FAX). unsecured loan requirements payday uk bush was interviewed about the scandal while still vice president. put all of us on edge.